Fragrance Free Moisture Shave by Kiss My Face works great, and causes fewer cuts and no razor burn. Great for sensitive skin! Fragrance Free Moisture Shave by Kiss My Face leaves my skin really smooth, soft, and moisturized! It also gives me the closest shave I have ever gotten in my life! Fragrance Free Moisture Shave by Kiss My Face is the only shave cream I use it leaves my skin soft and smooth, no more razor bumps and give me a close shave. A little goes a long way. 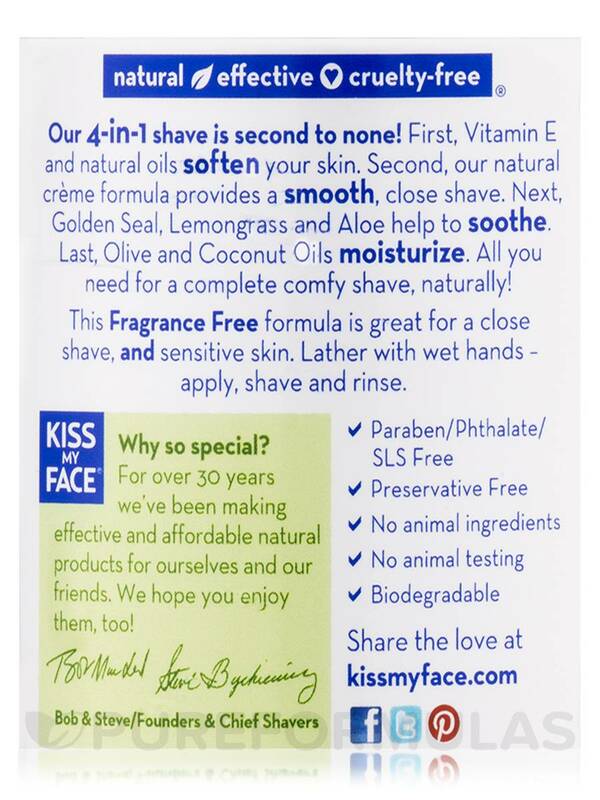 Fragrance Free Moisture Shave® from Kiss My Face® may provide you with one of the best shaving experiences. A clean shave is always appreciated and with ingredients like essential oils and vitamin E‚ this formula might just leave your skin feeling smooth and soft to the touch. 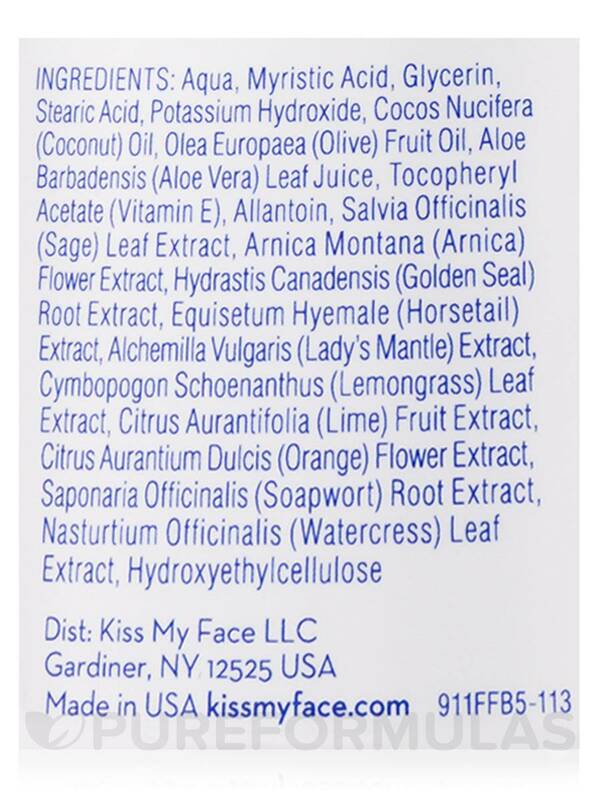 This product from Kiss My Face® contains vitamin E‚ an antioxidant vitamin‚ that could protect the skin from harmful environmental factors. It could also soften the skin. The crème formula is meant to provide a close shave‚ while the golden seal‚ lemon grass‚ and aloe could soothe any irritation caused by shaving. Olive and coconut oils have been added to provide ultimate moisture and leave the skin feeling supple. The fragrance free formula is designed specially for people who are sensitive to strong perfumes and those with sensitive skin. 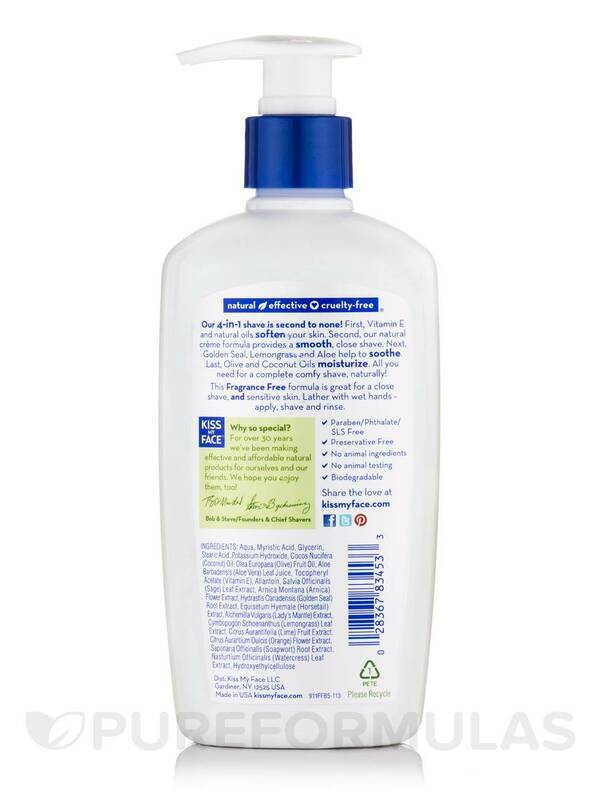 It is free from parabens‚ phthalates‚ artificial flavors‚ and fragrances. It is vegan and gluten free. For best results‚ lather the Fragrance Free Moisture Shave® from Kiss My Face® with wet hands‚ apply‚ shave‚ and rinse for a silky smooth feeling. Ingredients: Aqua‚ Myristic Acid‚ Glycerin‚ Stearic Acid‚ Potassium Hydroxide‚ Cocos Nucifera (Coconut) Oil‚ Olea Europaea (Olive) Fruit Oil‚ Aloe Barbadensis (Aloe Vera) Leaf Juice‚ Tocopheryl Acetate (Vitamin E)‚ Allantoin‚ Salvia Officinalis (Sage) Leaf Extract‚ Arnica Montana (Arnica) Flower Extract‚ Hydrastis Canadensis (Golden Seal) Root Extract‚ Equisetum Hyemale (Horsetail) Extract‚ Alchemilla Vulgaris (Lady’s Mantle) Leaf Extract‚ Cymbopogon Schoenanthus (Lemongrass) Leaf Extract‚ Citrus Aurantifolia (Lime) Fruit Extract‚ Citrus Aurantium Dulcis (Orange) Flower Extract‚ Saponaria Officinalis (Soapwort) Root Extract‚ Nasturtium Officinalis (Watercress) Leaf Extract‚ Hydroxyethylcellulose. Formulated with no parabens‚ no phthalates‚ no SLS. No animal ingredients‚ not animal testing. Preservatives free. Biodegradable. Gluten free ingredients. Vegan friendly Ingredients. No artificial fragrances. It does what it says, and my skin seems to like it. It's a little tough to get all of it out of the package,. I tried Fragramce Free Moisture Shave by Kiss My Face on my face and not only did it work very well it also only took one pump for my entire face ! Much less than traditional shaving cream ! My skin is sensitive so non fragrance was a must. Fragrance Free Moisture Shave by Kiss My Face leaves no nicks at all. Huge bottle, no nicks, and at a good price! Leaves my skin soft and smooth, is fragrance free (I have sensitive skin), gives me a close shave, and the price. I have no cons at all. I have super sensitive skin (like a baby). I have tried lots of shave gels, soaps, & even oils and have always had itchy legs and bikini razor bumps after shaving. 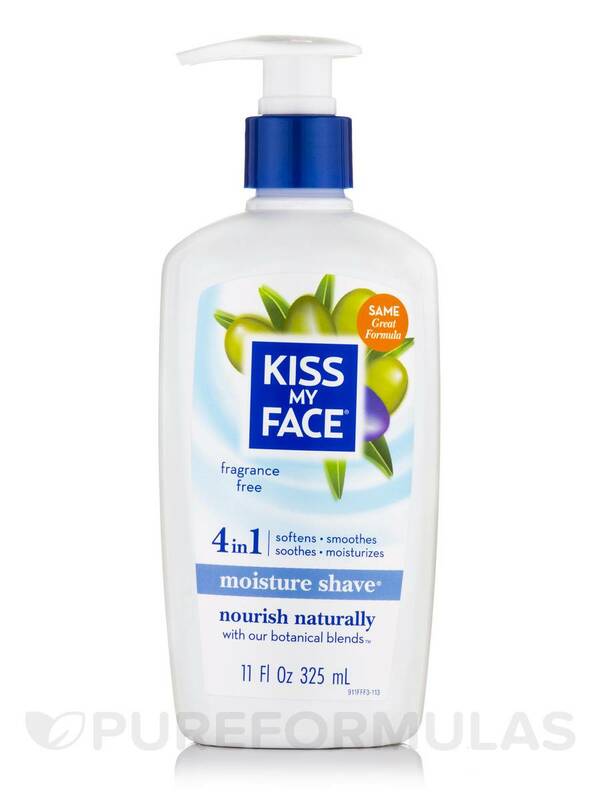 I apply Kiss My face Fragrance Free Moisture Shave, let it sit for just a few minutes, and then shave. Wow, what a difference! I have zero itchiness and zero razor bumps, in fact, my skin feels smoother & more supple than before I shaved. Wish I would have found these years ago. Also, the price is great because you need such a small amount, it will last a long time. I also love that it has no scent at all. Soothes skin instead of irritating it. Doesn't give no bumps or itchy skin after shaving. Has a great price, and zero fragrance. Awesome ingredients. 4 in 1 shave cream!!! Perfect for sensitive skin. fragrance free. Been using Fragrance Free Moisture Shave for a few years and it truly is amazing! NO heavy metals artificial perfumes etc. Doesnt foam up when lathering and lets me shave close and leaves my skin feeling ultra-cool and smooth and healthy after! Prefer this to even the other varieties by this company. Just a simple shaving cream that does the job is totally safe an amazing deal for the price and lasts a long time. TRY IT!! Whether youre feeling nauseous and cant stand the idea of using a scented shave cream or you just prefer a scentless cream that does not interact with your after shave/cologne this is the right stuff. The fragrance free cream is the same amazing formulation as the rest of the KMF cream just without the scent. Its always nice to have a really good neutral cream like this one waiting for those days when you just dont want to smell anything. Its like an amazing relief pitcher waiting to bring the game home. Too liquid when it first comes out.